Although Windows Vista is only scheduled for retail release on January 30th, 2007, there are already a lot of reviews for Windows Vista, or you can have a feel on Windows Vista by test driving Windows Vista Business for evaluation, where you can play around the Windows Vista desktop via a virtual console, just like you remote control a Vista machine. With sleek and stunning graphic user interface and lots of new features and improvements, Windows Vista has strives a more secure, more usable, more user friendly and more attractive operating system. It’s no wonder the Windows Vista system requirements, especially premium version will make your jaw dropped. If you’re still unsure of whether to upgrade to Windows Vista, or still blur about what’s so unique about features and functions in Windows Vista that not available somewhere else, an article on vista-hq.com lists out the top 10 new features in Windows Vista that you cannot find in other operating system such as Windows XP. 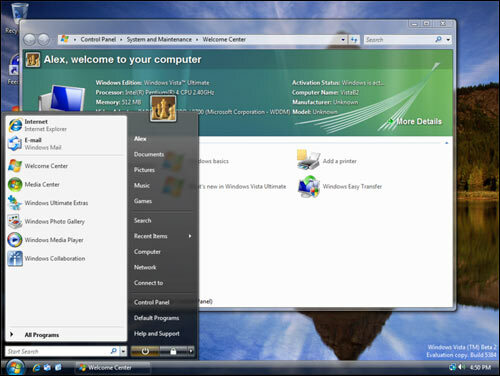 Windows Vista features four different levels of user experience—Basic, Windows Classic, Standard, and Windows Aero. All controls are totally redesigned in Windows Vista and look even better now. The Aero user interface is the top of the line and takes advantage of the latest advances in computer hardware. On computers equipped with graphics hardware that supports the new Windows Driver Display Model (WDDM), the Aero provides more stability and smoother window handling. The main element of this interface is the transparent glass design, with subtle effects such as dynamic reflections and smooth animations. The Windows Sidebar can be positioned on the right or on the left side of your screen and its associated with mini-applications called gadgets, that provide specific information. Like for example, the gadgets can give you info on the weather, show you the calendar, games, a calculator or all types of other tools. The Sidebar fits perfectly especially on widescreen monitors. It can be easily customized and you can add different types of gadgets. Gadgets are a new concept introduced in Windows Vista. They can connect to web services to deliver business data, weather information, news updates, traffic maps, Internet radio streams, and even slide shows of online photo albums. By default, the OS comes with a set number of gadgets to get you started, but you can always download more from an online gadget gallery. The Instant Search is a new feature that will help you find whatever you’re looking for. It is available almost everywhere in Windows Vista, in the Explorer Dialogs, in the Start Menu, pretty much in every system window. Using it, you can type a file name, a property, or even text contained within a file, and it returns pinpointed results. Besides that, the Instant Search also arranges the results depending on your current activity, whether it’s searching for music files in Media Player, or looking over all your files and applications on the Start Menu. 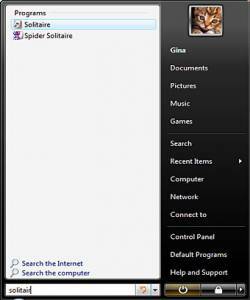 On the Start Menu, the Instant Search box is located at the lower left corner, and instead of going through all the programs installed in order to find the one you are looking for, you can just type its name in the box and as you type, Windows Vista instantly searches file and application names, metadata, and the full text of all files, and it displays the search results. It searches through everything – Applications; Favorites/Internet History; Files, including documents and media; and Communications, including email, events, tasks, and contacts. Windows Defender is a features that protects your computer from pop-ups, slow performance, and security threats caused by spyware. It works by monitoring key system locations for changes that signal the presence of spyware. The auto-update option will make sure that the Defender has all the latest spyware definitions from Microsoft. The interface is simple and easy to use, making daily tasks like as scanning, blocking, and removing unwanted software easier than ever. It has a built in Software Explorer that determines which software and services are running on your computer and stops or disables “rogue” software. It works in co-operation with Internet Explorer with the “Scan on execute” feature. This feature provides an added layer of protection, by scanning all downloaded files before they are saved and executed, thus reducing the chance that spyware might be installed by accident. 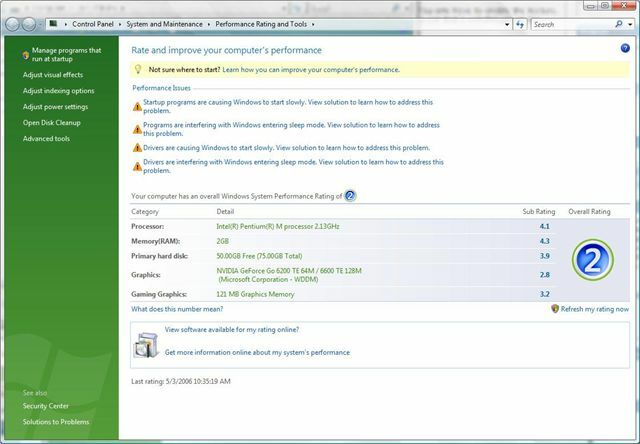 The Performance Center is a brand new tool that gives information on the PC’s performance characteristics and can manage and troubleshoot performance issues. The very interesting thing here is the WinSPR, or Windows System Performance Rating. This rating is from 1 to 5, and depending on your rating, you can determine if a given application can run on your machine. For example, if you have some of the latest hardware, your rating can reach 4.2 and it that case, any software with 4.2 or lower WinSPR will run smoothly on your computer. This new functionality makes it possible for you to keep your information safe from user error, hardware failure, and other issues that can result in data loss. There are several layers of protection to ensure maximum effectiveness. From the Backup and Restore control panel, you can enable the auto feature which automatically caches previous versions of your files to an image-based backup of your entire computer. Later, you can browse and search for files to restore from a backup. Another great new feature allows you to access previous versions of files without even having a backup. This is possible through the Volume Shadow Copy technology. If you want to do that manually, then you will have to use the File Back Wizard in which you select the types of files you want to backup, specify a storage folder and start the process at any point you want. There is also an automatic scheduling function. The system restore feature can reverse system changes, but still preserving your data in its current state. The Network Map is a new feature inside the Network Center that displays graphically your connectivity to the network and to the Internet. If a computer on the network loses Internet connectivity, you can graphically see which connection is down and then use Network Diagnostics to help determine the cause of the problem and find possible solutions. This is especially useful if you have a network of wired and wireless PCs and devices. With the Network Map you can increase the performance of the network and easily spot problems. ReadyBoost is a brand new technology that comes with Windows Vista. It’s a whole new concept that will change they way people add memory to a system. With ReadyBoost, you can use USD flash as RAM to extend system memory and improve performance. So instead of buying RAM and opening your computer, you can just plug the Flash. Plus, most motherboards have just two RAM slots, which will be taken anyway. Utilizing this technology is simple. Just plug the Flash in the USB slot and Windows Vista will check to determine if its performance is fast enough to work with Windows ReadyBoost. If that’s the case, then you’ll be asked if you want to use this device to speed up system performance. ReadyBoost is reliable as well as secure. You won’t loose any data, and the system will restore to its original level of performance when the Flash is removed. There is no wearing on the USB drive, because of the specifically optimized algorithms used. Windows ReadyDrive takes advantage of the latest hybrid hard drives to provide faster boot-up, hibernate, and resume. It works by writing data to the flash memory on the hybrid hard disk, which lessens the amount of spinning for the mechanical hard drive, thus saving battery power. And also increases the life of your hard drive. With a hybrid drive, Windows Vista can resume more quickly from Sleep because data can be restored from flash memory faster than from the spinning mechanical hard drive. For a large number of users, the PC has become mostly a source of entertainment, that you can enjoy by sitting back with a remote control in hand. That’s not something strange considering the enormous amount of media files that you can download online. The Windows Media Center enables you to enjoy live and recorded TV, music, photos, videos, and online entertainment on a single device. It can also be connected to Xbox 360 allowing you to transfer this experience in other rooms of your home. 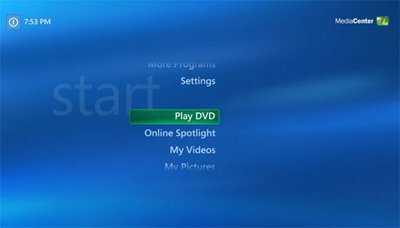 It’s integrated in the Home Premium and Ultimate editions of Windows Vista and also offers built-in support for archiving TV shows to DVD. It takes advantage of the very latest technologies including a support for widescreen and high-definition (HD) displays. There are three separate sections – music, digital photos, TV and movies. In the Music section, you can quickly browse your music by artist, song, or album title, as well as by genre, composer, or year. Regarding the photos, Windows Media Center can turn your simple photo collection into a cinematic slide show that can be shared on the television in the living room. On top of that, WMC provides seamless experience when watching your favorite television shows and movies.